Girls Education Collaborative | The whole girl. The whole world. There’s nothing a girl can’t do. When a young woman’s needs of health and security are met, and she is equipped with the skills and insights to transcend circumstances, she gains the opportunity to realize her fullest potential. This is the mission of the Girls Education Collaborative. The transformative power of education enables young women in developing nations to become catalysts for change in their communities. 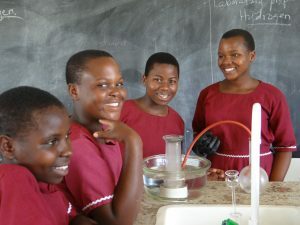 We accomplish this by forging local and global partnerships to complete projects centered around an integrated approach to educating girls and young women, opening a whole world of possibilities for their futures. Please explore this site to discover more about what the Collaborative is doing and how you can become a part of it. There are an estimated 120 million girls out of school world-wide because of culturally embedded gender inequity and the consequences of critical poverty. These girls want to be in school and the captains of their destinies. Our vision is to help them do just that. THROUGH THE POWER OF GIRLS EDUCATION. and to stay connected with our organization.